(ORLANDO, Fla.) December 26, 2016 – After a busy trip around the world, the man in the red suit enjoys his first day off here in Orlando. Santa Claus was spotted at Aquatica, SeaWorld’s Waterpark, splashing with a few of his elves in the Loggerhead Lane lazy river and later relaxing in his poolside private cabana. While Santa’s work for the year is through, SeaWorld has one more special offer. Starting tomorrow, current waterpark pass holders can “up-cycle” their annual pass from any Orlando waterpark and save $19 on a new 2017 Aquatica Annual Pass. 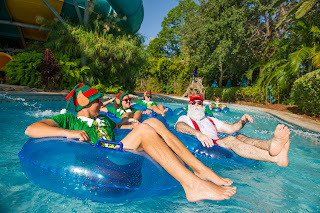 With more than 40 thrilling waterslides and 84,000 square feet of white, sandy beaches, Aquatica is the place to enjoy water park adventures all year. Like Santa’s vacation, this deal won’t last forever. Guests must purchase their new Aquatica Annual Pass by January 9, 2017 and visit by January 31 to participate in this limited-time offer. For additional details, visit www.Aquatica.com/Upcycle.